Lot # 22: 1947-’66 Exhibits – Jackie Robinson Rookie Card (PSA Mint 9) - “1 of 1” & THE SOLE HIGHEST GRADED EXAMPLE! 1947-'66 Exhibits – Jackie Robinson Rookie Card (PSA Mint 9) - "1 of 1" & THE SOLE HIGHEST GRADED EXAMPLE! The convoluted discussion over what is Jackie Robinson's "TRUE" rookie card continues to be one of the hobby's major "black holes". While many enthusiasts have dubbed his 1948/'49 Leaf subject his mainstream rookie card, the FACT REMAINS that Robinson had several cardboard issues unquestionably distributed in 1947; at least a full calendar year before his '48 Leaf subject was ever available to the general public. These '47 issues include his Bond Bread "Portrait" subject, Homogenized Bread, and 1947 Exhibit Card (distributed over many years after 1947 as well). With regard to the latter, Jackie's 1947 Exhibit subject was issued over a 20-year period by the Chicago based Exhibit Supply Company and portrays a classic Jackie Robinson "running the bases" pose. The colossal 1947-1966 Exhibit compilation consists of roughly 336 subjects including all of its many variations. 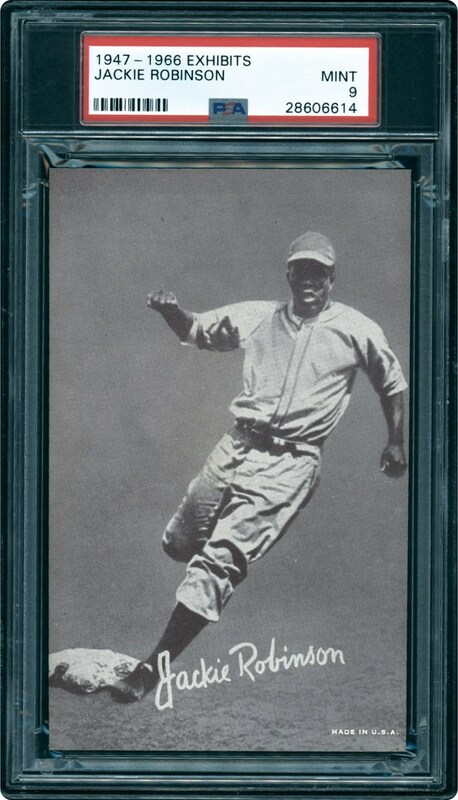 As is the case with virtually all post-WWII sets, one of the most valuable cards is the Jackie Robinson subject, with his seldom-surfacing 1947 Exhibit presented here in a breathtaking PSA Mint 9 holder. Synonymous with Robinson's unparalleled stature as "the player who broke the Major League color barrier", this amazing gem just happens to be the SOLE PSA MINT 9 example and the finest of its kind! Indeed, not a single specimen has managed to either achieve another "9" or "10" technical assessment, immediately placing this "1947 issued" Robinson keepsake as one of the most significant cards in our illustrious hobby! Almost sad to say, Robinson's remarkable batting, base-running and fielding skill sets simply get lost in the shuffle due to his "godly-like" stature as our National Pastime's inaugural African-American player. A spectacular second baseman, he could hit for average and power, and unquestionably stands as one of the finest baserunners in baseball history. Yet, when all is said and done, his iconic standing stems from the embodiment of courage he displayed when he joined the Brooklyn Dodgers in 1947. Simply stated, his legendary status extends far beyond baseball, for his unbridled bravery ultimately supported the justified notion that "all men are created equal", with his immortal stature a sheer testament for the proud foundation America was soundly built upon. 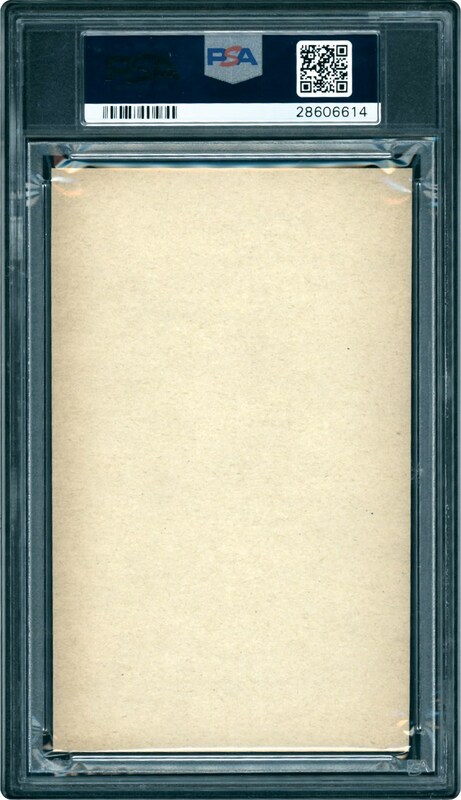 This near-perfect PSA Mint 9 offering resides as a "perfect" representation of the immortal Robinson via its pinnacle Mint 9 grade; rightfully earned via all of its pristine-like attributes and awe-inspiring aesthetics. One of the true 1947 Jackie Robinson rookie cards and similar to his unbounded popularity, its premier "1 of 1" technical assessment has likewise withstood the "test of time," serving as a steadfast reminder of Robinson's remarkable qualities that will surely "echo for eternity"!